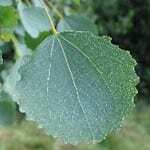 Aspen is a pioneer species like birch and willow. This means that it is one of the first plants to colonise new open space. By doing this, it prepares the ground for other plants which need better soil conditions. Aspen grows quickly, but its life is short. It may reach 100 years old, which is a short life for a tree. Other tree will later take its place, like oak. The leaves are rounded and similar in shape to a heart. 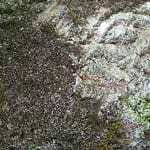 They are between 5 and 8cm long with rounded teeth around the edge. The leaf is dark green above and below it is a blueish or greyish- green. The stalk of the leaves are flattened and about the same length as the leaves. Each little gust of wind can move the foliage and it may appear that the leaves, or in fact the whole tree, is trembling. In March and April the flowers appear before the new shoots. Aspen has only female or male flowers on each tree. 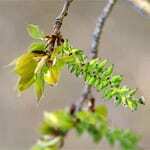 The male flowers are brown catkins up to 12 cm long. They turn yellow with pollen. 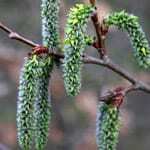 The female catkins are green and shorter than the male flowers. Female catkins develop into fruits after pollination by the wind. Fruits appear in late May and early June. They are tiny green capsules, which are carried on the wind by white cotton hairs. The bark of aspen is greenish-grey and smooth. When the tree is older the bark darkens. It has lenticels (holes through which to ‘breathe’) and is occasionally sticky. 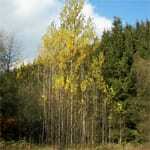 Aspen is a pioneer plant. 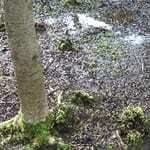 It is normally a modest tree, but it grows very well on moist, rich soil. It needs a place with plenty of light to grow well. Aspen seeds are dispersed by wind and the seeds can travel a long way from the mother tree. When they reach open ground with good moisture it will grow quickly.